Jose Mourinho: Fernando Torres won’t return to Chelsea Chelsea boss Jose Mourinho has ruled out all the rumours linking his player Fernando Torres with a return to his parent club Chelsea. Chelsea boss Jose Mourinho has ruled out all the rumours linking his player Fernando Torres with a return to his parent club Chelsea. 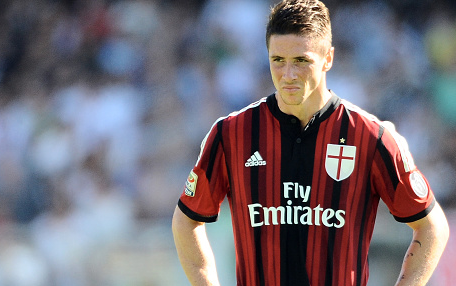 Fernando Torres joined AC Milan on a two-year-loan in the summer but has failed to prove himself in Italy. He has scored only a goal for the Serie A side so far. Reports have claimed that Milan are planning to offload him back to Chelsea as the striker is useless for them. While Chelsea manager Jose Mourinho denied earlier today that Torres is not coming to Chelsea. There is no place for Torres at Stamford Bridge despite the Portuguese still consider him as a quality player. Even if Torres return there will be zero percent chance for getting a role in first team. The Blues paid 50 million pounds for the Spaniard in January, 2011. He never proved his worth while wearing a Blue jersey. He played wonderful years at Liverpool but failed to convert those same years in the Blue kit. The boss has denied all the reports as rumours and the Spanish striker is happy in Milan according to him. The 30-year-old former Atletico Madrid striker scored only 45 goals in 172 appearances in his 3.5 seasons for Chelsea. Currently for Milan, he is struggling to find his second goal of the season.